Hi friends! 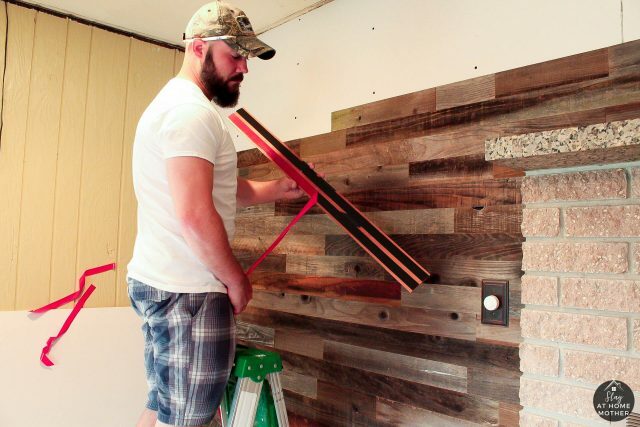 I’m incredibly excited about this post, which is in partnership with Plank & Mill, a company that makes peel-and-stick reclaimed barn wood planks. 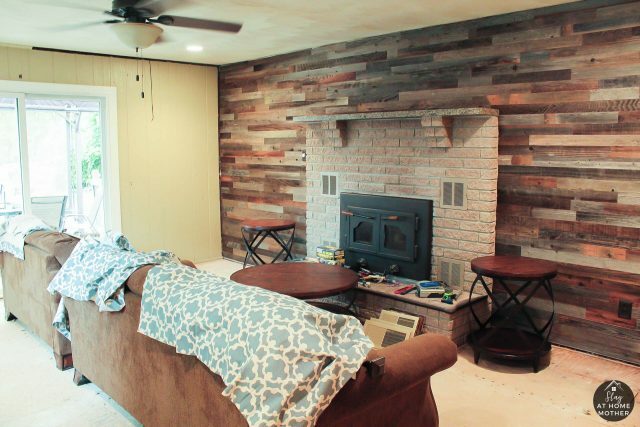 With Plank & Mill’s reclaimed barn wood, we were able to take our outdated (and frankly, dangerous) rock accent wall in our family room, and turn it into a beautiful rustic living space. We’ve been slowly updating our home to be more in the farmhouse style, and this wood accent wall would be perfect for our living room. We debated doing a shiplap wall, but being that we have painted paneling on the other three walls, we decided that was just too many painted lines in one room for us ;). 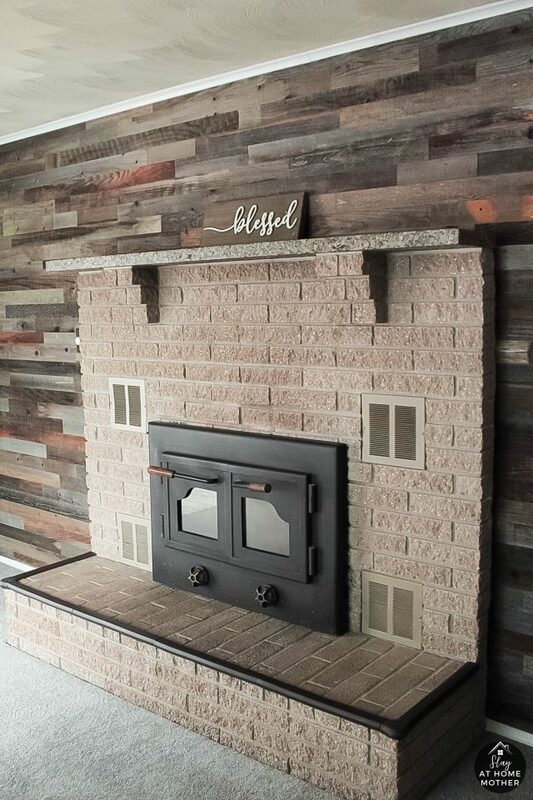 This wall added some much-needed warmth, texture, and that rustic feel we were craving in our home. I’m finally ready to share our accent wall with you guys, and I think you’ll be just as excited about it as we are! 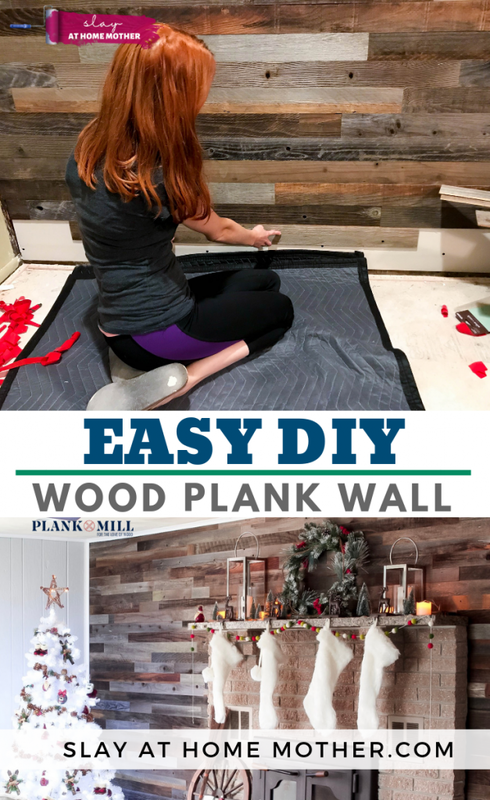 DIY Wood Plank Wall Success! We called this room ‘the brown room’ because everything is brown! 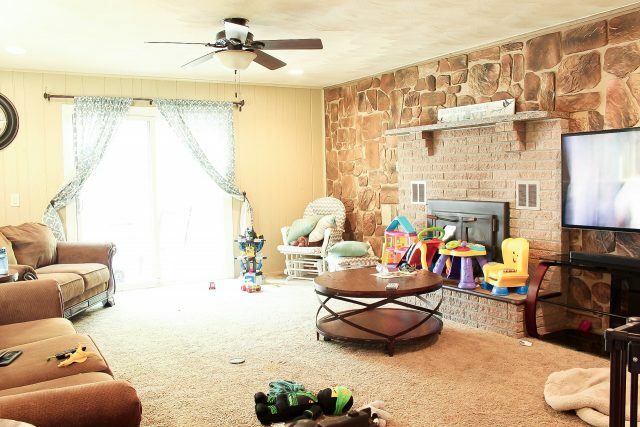 The shad carpet was brown, the walls were a warm yellow/tan color, the fireplace was tan, our furniture was brown, and even the accent wall was made up of different colors brown rocks! Especially with the evening sunlight, the rocks on the wall and the painted walls would take on an orange-like color. This wall was put up by our home’s previous owner. The main driving force for changing our rock wall was the fact that the rocks would actually fall off of the wall. We even had one of the rocks fall off onto our flat screen one evening after work, unprovoked. After we first moved in, my husband Chris had to screw some of the rocks to the wall to prevent them from falling. You can see some empty spaces on the wall where some of the larger rocks fell – but when these rocks fell, they shattered and couldn’t be reapplied. With two small children, two pups, and our flat screen at risk – Chris and I put our heads together and tried to figure out what we could do to make this room work for our family…so we went into DEMO mode, and never looked back! We actually ended up doing a complete reno of this room, which I will share details on later this week. To get rid of the rock, we had to remove each one individually. If you’re imagining Chris and I up on a ladder with a crowbar and some serious elbow grease, you’d be right! Some of them were applied with caulk and took some serious force to remove, while some were barely hanging on with a screw here or there. They were applied very irresponsibly, and I’m not happy with the previous owner for the lack of care that was taken with the application and the securing of the rocks. Needless to say, it was time to figure something else out and get with the times. It’s crazy to look back at these photos and see just how far we’ve come! 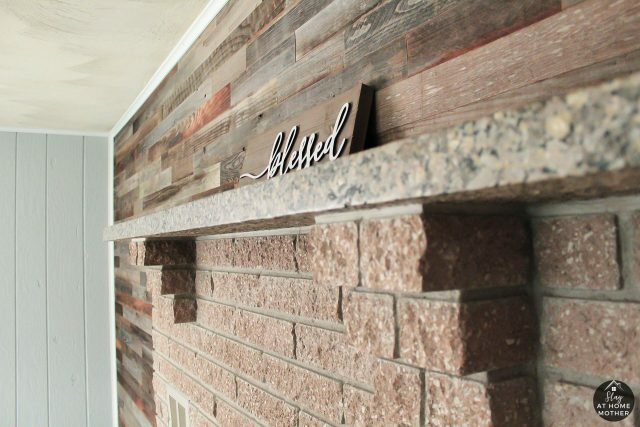 I was so happy to receive our reclaimed peel and stick wood planks from Plank + Mill. Per their directions, we let him breathe and adjust to our home for 48 hours, and used that time to start demoing our living room. We started off by removing the rocks from the walls. The drywall needed to be removed as well, since some of the rocks were clinging to it fiercely. 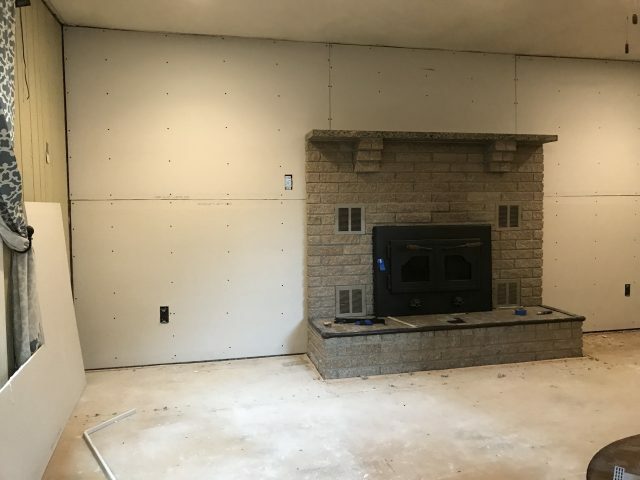 We removed everything from that wall, and new drywall was measured and put up around our built-in fireplace. We disposed of the rocks and debris and took a chance to take in the sudden dramatic change that had occurred before our eyes. 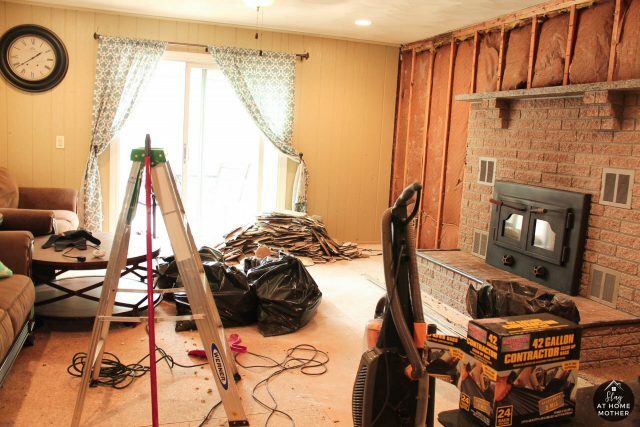 Even with just the drywall up – the room took on a completely different feeling! We thoroughly vacuumed the drywall (to get rid of any extra dust and debris for clean application), mapped out the pattern of planks, and started applying our new accent wall from Plank & Mill! When I say ‘pattern’, I don’t mean we used a pattern at all. We applied them in a manner that visually appealed to us, by selecting planks to go next to/above/below other pieces to help each one stand out. Each plank has a unique quality, and pairing it randomly with another plank that would bring that out was key. But it was easier than I’m probably making it seem. I had to take over this ‘randomizing’ process because Chris is overly OCD about patterns, colors, and the way things look visually. With the rustic theme we were going for, patterns and uniformity don’t apply. *Plank & Mill recommends that once you receive your box(es) of planks, to open your box(es) and allow them to remain in your home for 48-72 hours prior to use. 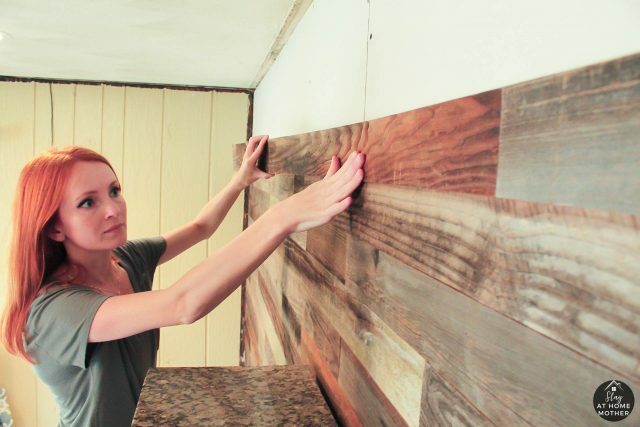 Also, begin the application by performing a test – take one of your planks, apply it to the surface/wall, and wait 48 hours to ensure the adhesive will stick to the surface. If it sticks, you’re good to go! If you’re considering painting before application, know that you’ll need to wait 30 days for the paint to cure and wood plank adhesive to be able to adhere to the painted surface. For our accent wall, we chose to apply the planks directly to the drywall we put up (although we took careful steps to ensure it was clean of dust or debris). We started the application once the kids were in bed on a Saturday night, and then during Jaxson’s nap the following day. This way, we weren’t being interrupted by our little boogers ;). The application was so easy, we simply pulled off the plastic backing from the adhesive strips, and applied to our drywall! The planks were pretty flexible! We took our time applying them to ensure longevity, although I don’t think it would have made a difference. Once the planks were on the wall, they were there to stay ;). Check out our time-lapse video below! The picture below shows you what the wall looks like all done! We still had plans to paint and apply trim in the room, although even with the walls still being a color Chris and I have begun to call ‘Smoker’s Yellow’, the wall had already improved the look of our family room! I felt that it actually brought out more of the natural tan tones in our fireplace, which had a tendency to appear pink at times, ha! Chris and I can’t stop staring at our beautiful new accent wall! It is rustic, natural, and gorgeous! 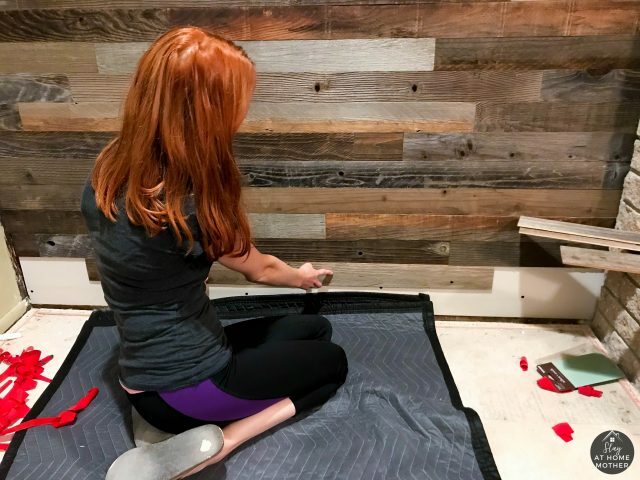 The planks each have their own unique characteristics, and it was truly fun to put them together in our own way, uniting colors, textures, and patterns together to help make each plank stand out on its own on our wall. Some planks had specs of paint, while others had split colors and knots. Keep an eye out for the rest of our family room refresh, which I will be sharing in a few days! 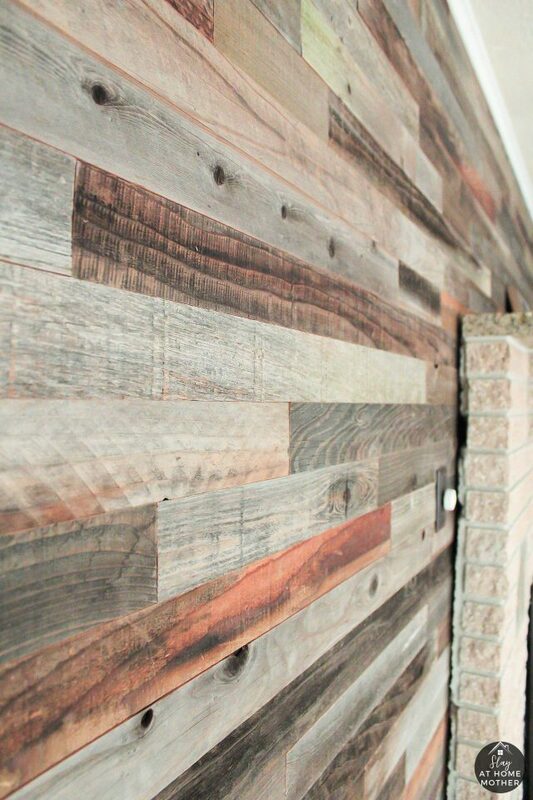 Tell me – what are your thoughts on our reclaimed wood wall, and what project would you use Plank & Mill’s reclaimed wood planks for? that’s great, the wall looks amazing!! I absolutely LOVE what you have done with room. Beautiful. Gives it such a fancy yet cozy feel. I love it! What a fabulous idea and DIY! Thanks Rebecca, it is definitely the easiest DIY I’ve done to date, and it came out beautifully. Wow ! What a project! The after pictures look amazing! That wall is GORGEOUS! Great job! !